Murcott tangerines are medium-sized, round and slightly flattened at both ends. They are about 5 centimeters in diameter and have a golden orange skin with subtle pebbling. The rind is thin and fragrant and clings to the flesh, making them moderately easy to peel. The pulp is bright orange and juicy with a rich, sweet flavor. 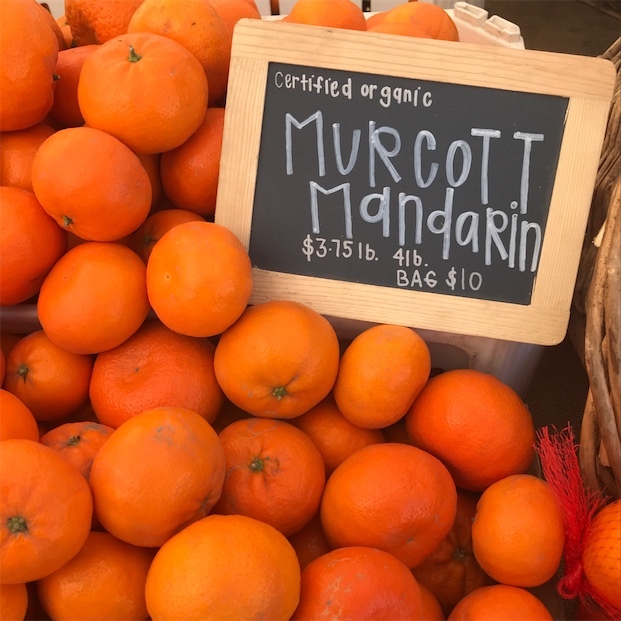 Murcott tangerines can be seedless or may have up to a dozen small seeds. Murcott tangerines are available in the winter months. Murcott tangerines are a late maturing variety, botanically classified as Citrus reticulata. They are a hybrid of a tangerine and a sweet orange made sometime around the turn of the 20th century. Until recently, they were marketed under the name ‘Honey’ in Florida, which caused confusion, as there is a California tangerine hybrid of the same name. Most Florida sellers currently use the name ‘Murcott Honey’ to distinguish the two. The Murcott is one of the most widely grown late Florida tangerine varieties. Mucott tangerines are high in vitamins C and A and are a good source of fiber. They contain beneficial minerals like potassium and calcium and the antioxidant beta-carotene, and flavonoids hesperetin and naringenin. Murcott tangerines are used primarily for their juice due to their high seed content. Freeze the juice for sorbets and granitas, blend with other citrus juices, or use in jams, curds and tarts. Add segments to salads and pair with duck, fennel, avocado, onion and olives. Use fresh chiles and herbs, goat cheeses, honey, ginger, young olive oils and dried spices such as cinnamon, oregano and saffron. Murcott tangerines will keep at room temperature for up to a week and up to two weeks when refrigerated. The Murcott tangerine has experienced a continual case of mistaken identity in the 100+ years since it was first developed. In the highly cited 1967 publication of ‘The Citrus Industry Vol. 1’, citrus breeders advised growers to stick with the cultivar name “Murcott” to avoid confusion with the California hybrid named “Honey” and the erroneous name “Smith” that was used for the fruit sometime during the 1930s. To even further the confusion, a hybrid under the name W. Murcott was introduced in California during the 1990s and is currently trademarked under the name ‘Delite’. The Murcott tangerine's origins began in the early 1900's at a breeding nursery in Florida. Murcott tangerine trees were created from budwood by Charles Murcott Smith.  Commercial production of the Murcott tangerine would occur on a large scale in the 1940's and continues to grow as an important tangerine variety in citrus growing regions of Florida and California. Murcott tangerine trees are cold hardy though not frost resistant. When trees bear heavy crops in one season, they often do not bear fruit the following year. Recipes that include Murcott Tangerines. One is easiest, three is harder. 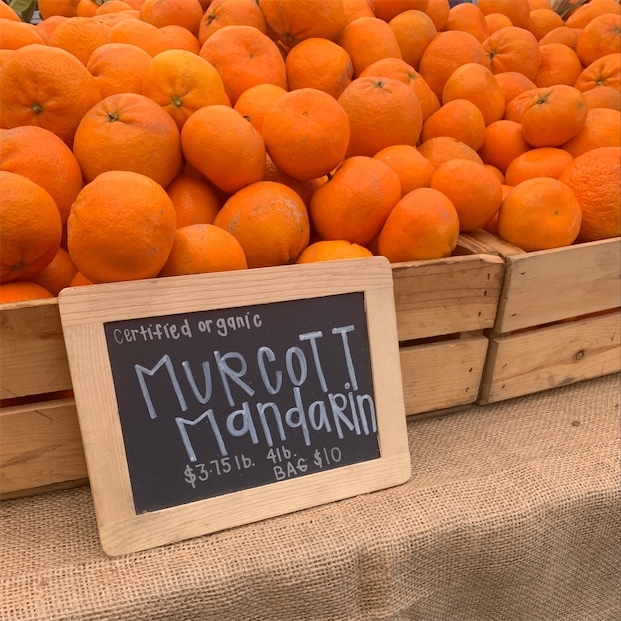 People have shared Murcott Tangerines using the Specialty Produce app for iPhone and Android. Sharer's comments : I spotted Murcott Tangerines at ! Sharer's comments : Murcott Tangerines spotted at First Alternative Natural Foods Co-Op.